The Google Opinion Rewards app for Android has had a small but nice update to it this weekend. The update expands the free Play Store cash app to Austria and Switzerland firstly, allowing Android users in those countries to fill out surveys and get Play Store credit in return to spend on whatever they want in the Store. This brings the app to 17 different countries globally. If you aren’t familiar with the app, it is pretty simple. You are sent survey’s periodically to fill out and get anywhere from a few cents (or your local currency) up to $1.00 for completing them. They are sent to you at random and as you fill them out, you get these credits to spend in the Play Store. You can always check out which countries are eligible and added at this link. latest update now gives an audible update. Both notification styles seem to be far more reliable with this update. Since I updated my Nexus 6P, I have had more notifications of available surveys than I’ve had in months. 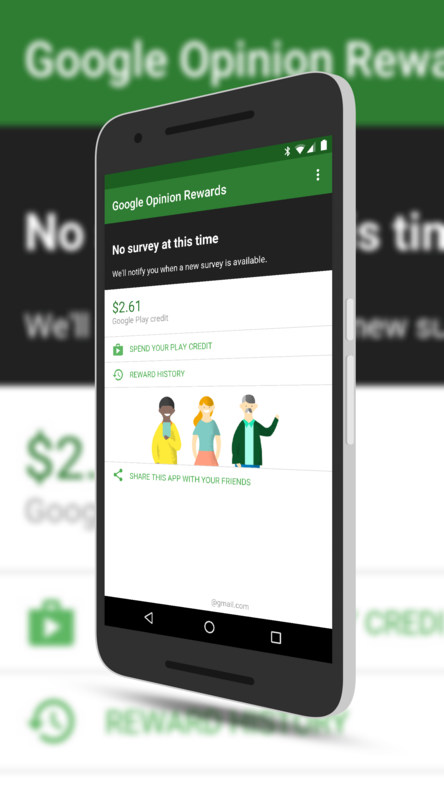 The Google Opinion Rewards app is free and signing up is free. Once you do, you’ll start getting surveys sent to you.